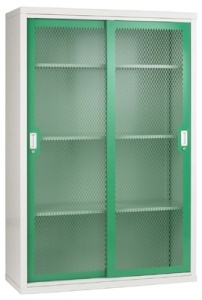 Control your stock and inventory items conveniently with this high quality mesh sliding door cabinet. 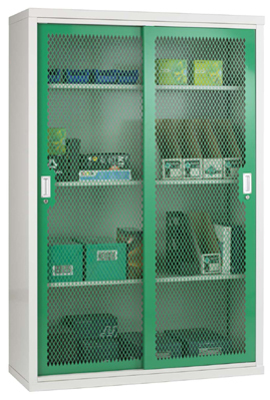 Built for industrial workplace use, this cupboard features an all-steel welded carcass for a long service life and strong mesh covered doors to provide visibility of the products within. Use it to safely store high value goods, documentation or workshop equipment, twin lockable sliding doors ensure restricted access. 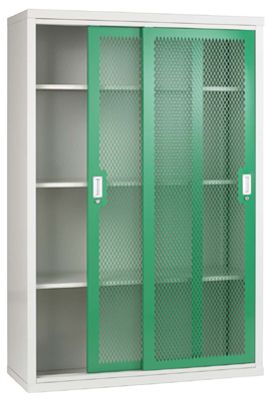 The 6ft high cabinet comes with 3 x height-adjustable steel shelves that can each hold up to 75kg in weight, the bottom level can also be used for storage but is fixed in position.